Owl and the City of Angels is book two in The Adventures of Owl series. This time around Alix Hiboux (aka Owl) is running a job for her dragon employer. The book opens with Owl at a dig site on the hunt for a medusa head. You see, Owl is an international antiquities thief for hire. While she'll do most jobs, she tries her hardest to stay away from the supernatural ones. She seems to get backed into corners and forced to do those quite a bit though. The book starts off with action and really doesn't let up. Like in book one, we go on a world tour of sorts along with Owl which I really enjoyed. Owl finds out partway through the book that someone is impersonating her. They're doing reckless jobs that even she wouldn't sign up for. And in doing so, the IAA (International Archaeology Association), the vampires, and even her boss are on her case. In attempts to clear her name, she has to locate the artifacts, get them back, and find out who's behind it before they set something loose in the world that could threaten humankind. All in a normal days work for Owl. 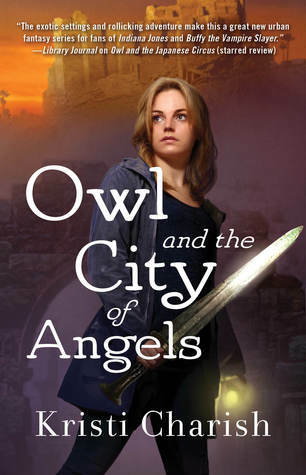 Owl and the City of Angels is a fast paced adventure you won't be able to put down. While I don't see Owl guzzling energy drinks I feel that she has to in order to keep her head above water. I will admit, it leads to an interesting read that keeps you on your toes. Her friends from book one made appearances, her BFF Nadya is ever helpful when Owl gets in a tight jam. Owl's boyfriend Rynn is her security detail from her dragon employer. I will say for someone so set on not being around supernatural jobs/people/etc, Owl is fully immersed into that world and keeps taking more and more on. I'm hoping she'll fully accept it in the next book, she's slowly changing but I'm hoping to see more character growth in the next installment. All in all I really enjoyed Owl and the city of Angels, I'd recommend this series if you're looking for a supernatural rich story featuring a treasure hunter. Yeah, I'll be interested to see what the next book holds. It seems like everyone I know is going crazy about this series, I'll definitely have to get to it! And, of course, I hope there's going to be more character growth in the next instalment, you know that is something I really look forward to in my reads as well. lol! I'm enjoying the series so far, can't wait for book three :) Really hoping it shows more character growth, I always look for that as well. gah this is edging close to the next series to read for me, it looks good and something I would really enjoy :D Owl especially. :) I'm enjoying them, they have interesting paranormal beings in it too. I remember when the first one came out. It caught my eye. Now you're making me want to read this series. Hope you enjoy if you read it! I'm digging the series so far. I've seen this one popping up around the web. I'm becoming more and more curious about it. :) Thanks for sharing about it. No problem! I'm glad I started this series, hope you enjoy if you read it!